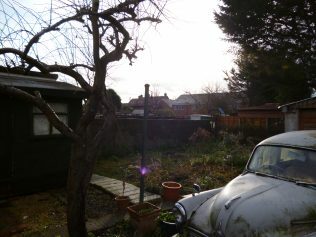 Maria talks about how much she loves her house and garden (pictured), attending the Ukrainian Club, and working at Coney Hill hospital for 10 years. Maria jokes about her first impressions of Gloucester station and describes her first job in a nursing home in Malvern. Maria recalls getting lost on the way back from working at Coney Hill hospital and having to ask policeman for directions. Maria describes the traditional Ukrainian bandura harps that her husband made by hand. Each bandura could take him a year to make. He was the only person in England who could make them. Maria talks more about her husband, Mr Hlad (pictured with bandura), and learning about each other's language and culture. Maria describes the best times at the Ukrainian Club on Midland Road. Maria explains why she enjoys living in Gloucester and the opportunities it has given her grandchildren. 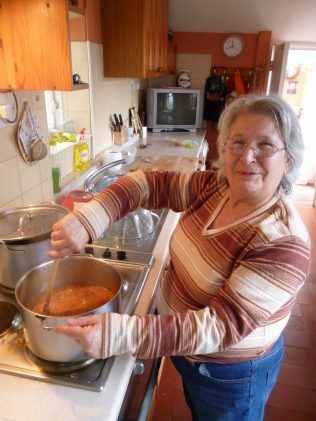 Maria arrived in Gloucester from Naples in 1950s. Initially she went to work in Malvern in a nursing home looking after elderly relatives when their carers would go on holiday. She knew no one when she moved there, but got to know people through work. She can remember all the English and Italian girls mixing and working well together. Maria moved to Conduit Street and worked at Coney Hill hospital as an orderly for ten years. In the third clip she remembers getting lost on the way back from work and having to ask a policeman for directions! 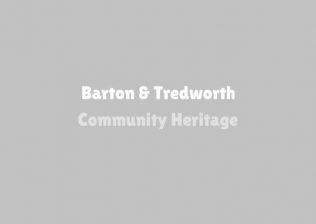 During this time she moved to Painswick Road. 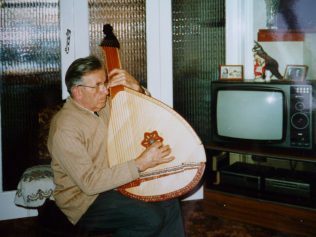 In the garage of this house, her husband would make the traditional Ukrainian instrument called the bandura (pictured above clip 4). 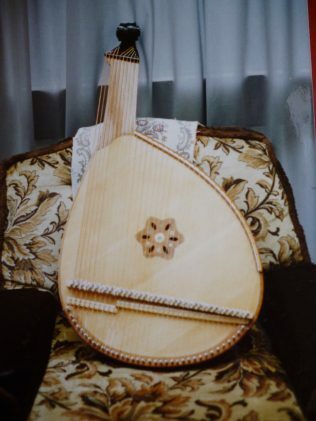 The bandura is a stringed instrument, like a harp. Mr Hlad was a real craftsman and made each instrument by hand. Maria says that it could take him a year to make each beautiful instrument. His instruments were highly prized and he was the only man in England who made the instrument at the time. He sold many of them to customers in America. Maria recalls getting to know her husband and learning about each other and each other’s language and culture. Maria would teach him her Italian language and culture and he taught her his Ukrainian language and culture. Maria describes the dances they would attend at the Ukrainian Club on Midland Road on a Saturday night, and that the bandura would be played while people danced. However, these days she says that younger people don’t know how to play the bandura so they aren’t used at the dances anymore. In the final clip, Maria talks about enjoying living in Gloucester and the educational opportunities there for her grandchildren. All her grandchildren can speak English, Italian, and Ukrainian. The picture accompanying the final clip shows Maria in the garden she loves so much. 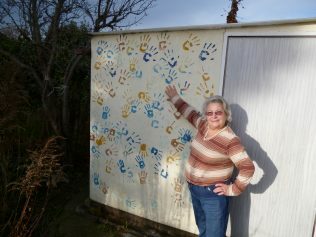 The wall of her garage has been decorated by her grandchildren with their handprints. Here she adds her own!